Aachen Cathedral started to build during Charlemagne's reign and finished several centuries later. Charlemagne (Charles) was tall and strong; he was fond of physical exercises, hunting and was no heavy drinker. He spoke Frankish, Latin and a little bit of Greek. Nevertheless, he never learned how to write properly. He built a palace in Aachen and brought many learned men to his court. His long reign changed the political and cultural landscape of Europe. Some historians claim that his rule can be seen as the proper beginning of the “real middle ages”. The pacified regions of Charles’s empire were ruled by dukes, while the marches were ruled by so called margraves. The sons of Charles ruled as kings of certain areas. For example, Pepin reigned as king of Italy from 780; Luis was crowned as the king of Aquitaine in 781. There were special officials that were used to get Charles’s orders to the dukes and margraves; they were also used to scout out the sentiments of a certain region for their king. Charles gained the title of Emperor in 800, which he deemed as an event of utmost importance. His ambition was to match the Byzantine Emperors with their architecture and court life. 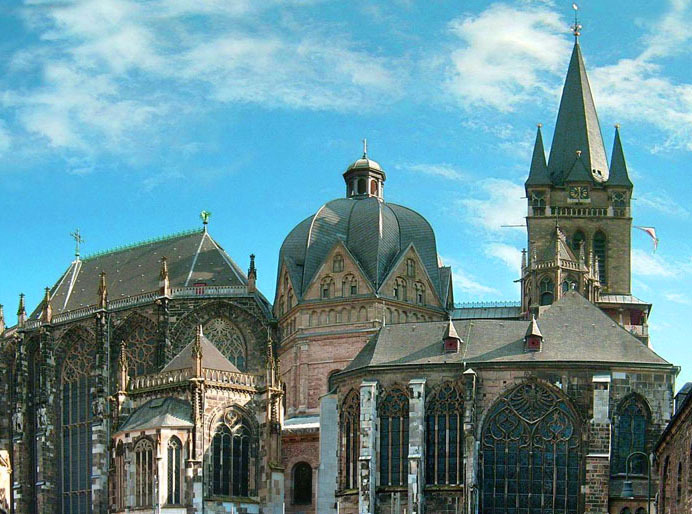 Palaces and churches were built in Aachen, Ingelheim, Worms and other places where Charles placed his migrating court. The vast majority of Carolingian buildings were made out of wood. No such building were preserved, the only remnants are stone churches. One of those is the chapel of Aachen, which was completed in 805. The chapel is an integral part of the Aachen Cathedral today. This remnant of Carolingian art shows us that imitative character of Carolingian architecture. The Aachen chapel is a copy of the eight sided church of saint Vitale in Ravenna, the oldest preserved example of Byzantine art (6th century). According to the descriptions that we find in the sources, the palace of Charlemagne in Aachen was a copy of the palace of Theodoric the Great in Ravenna. De litteris calendis is a letter that was written around 780/800; and the older of the two surviving manuscripts is located in Germany in city Wuerzburg. The letter, which was addressed to the abbot of Fulda, was dictated by Charles himself. It is written that the scholarly ways need to be preserved and that the education of priests which will have better understanding of Christian authors is a mission of the monastery schools. The schools were reserved for the aristocracy and a small fraction of educated people. These people were usually related and had the same goal. The school system was based on monasteries and cathedral schools. There were inner and outer monastic schools. The outer ones were accepting a wider array of people and they were teaching basic knowledge and writing. The inner school was for priests, that is, the elite of the medieval society. Worldly knowledge was gained at the courts or the cathedral schools. Boys from higher society were educated in cathedral schools, and they would later take strategic positions in the church hierarchy. The schools were led by an archbishop who was chosen by the king. The best known cathedrals were the ones in Laon, Meinz, Reims and Orleans. A redaction of the Bible was ordered by Charlemagne, to purify the Latin language. Alcuin is one of the best known Carolingian intellectuals. After settling in Charlemagne’s court, Alcuin became his advisor when it comes to questions of education. He was his personal teacher and educator of his kids. Other important members of Charlemagne’s court were Theodulf, the bishop of Orleans, the learned Langobard Paulus Diaconus, which Charles invited to his court due of his vast knowledge of grammar as well as Latin and Greek authors. One on of the students of the court school was Einhard. He completed his early education in Fulda. He continued his studies at the court where he was later engaged as a teacher. Charles granted Einhard the supervision of the king’s building and some monasteries, as well as important diplomatic missions. His best known work is the Life of Charlemagne, written in 833 and clearly inspired by Suetonius.